Most MRI examinations require no preparation. You can eat and drink normally before and after the scan. It is important to bring any previous films with you to the appointment. If you experience symptoms of claustrophobia or are unable to lie flat comfortably, then it is advisable to contact us prior to your appointment. Your doctor may prescribe an oral sedative medication for you to take with you for your MRI appointment. Alternatively, mild intravenous sedation can be administered during the examination. If sedation is required, you will need to fast from midnight the night before your appointment. Your routine medications should be taken normally. After your scan, you will need to remain under observation for some time in order to recover from the sedation and you will need to be accompanied by someone who can drive you home. You must not drive yourself home. If you are having an MRI of the abdomen, you will need to fast for four (4) hours prior to the examination. If you are having an MRI of the head, please do not wear eye makeup. When you arrive at the clinic, you will be required to register at the reception desk and complete an MRI safety questionnaire. This assists us in identifying if you have any metal, surgical implants or electrical devices that may not be safe to go inside the scanner’s strong magnetic field. Some patients with cerebral aneurysm clips, infusion pumps, neurostimulator devices and cochlear (inner ear) implants are unable to have an MRI scan or may require the examination to be modified. If you have had metal in your eyes or other parts of your body (i.e. shrapnel or metal slivers from grinding or welding), you may need to have an x-ray before your MRI scan. It is very important to have any metal fragments in your eyes removed prior to the scan. You will be asked to change into a hospital gown to avoid metallic objects being inadvertently taken into the scanner. Lockers are provided for wallets, watches, mobile phones and other personal items. Please do not take credit cards into the scanner room as the magnetic strip may be erased. 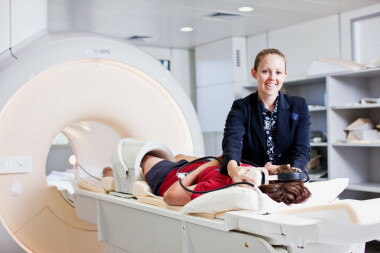 Your MRI examination will be performed by a qualified and accredited MRI technologist (a radiographer or medical imaging technologist who has completed further MRI study). 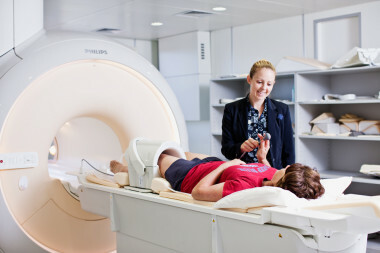 The MRI technologist will help to position you on a movable table and will try to ensure that you are as comfortable as possible prior to commencing the scan. The table will slide slowly into the centre of the scanner which is shaped like a tunnel with flared ends. The scanner is well lit inside and is open at both ends. A two-way intercom allows you to communicate with the MRI technologist. If at any time you become uncomfortable, a buzzer enables you to alert the technologist. While the scanner is taking pictures, you will hear a variety of thumping, whirring or banging noises. There is no need to be alarmed by the noises. These are the normal sounds produced by the scanner and can be quite loud. We will provide you with earplugs or headphones to minimise the noise during the procedure. You need to lie as still as possible during the scan otherwise the images may be blurry and the scan may need to be repeated. Some MRI examinations require an injection of a special intravenous contrast or dye (called Gadolinium). This can provide additional detail on the MRI pictures and is usually injected into a small vein in the elbow or the back of the hand. As with all medications, a very small number of patients may be allergic to the contrast injection. If you have kidney disease, you may not be able to have the contrast injection. The MRI technologist or radiologist will discuss this with you. MRI is usually avoided in the first trimester of pregnancy unless there are special circumstances. Please notify us if you are pregnant or if you think you may be pregnant. Your MRI scan will be analysed and reported by a fully qualified and accredited Specialist Radiologist (a medical doctor with specialist training in diagnostic medical imaging and additional advanced training in MRI). 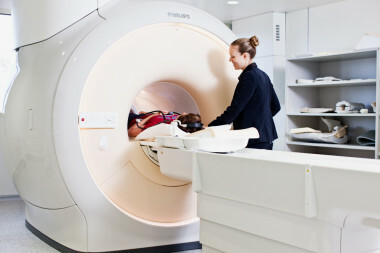 The MRI scanner generates a large number of images which need to be carefully analysed by the MRI radiologist. The processing, reviewing and reporting of your MRI images may take up to 1 or 2 hours. Additional time is required for typing the report, printing films and creating a CD of your images. Usually, the report is available to your referring doctor the next working day. Please notify the reception staff if you are going to wait for your films.